A one tide day? 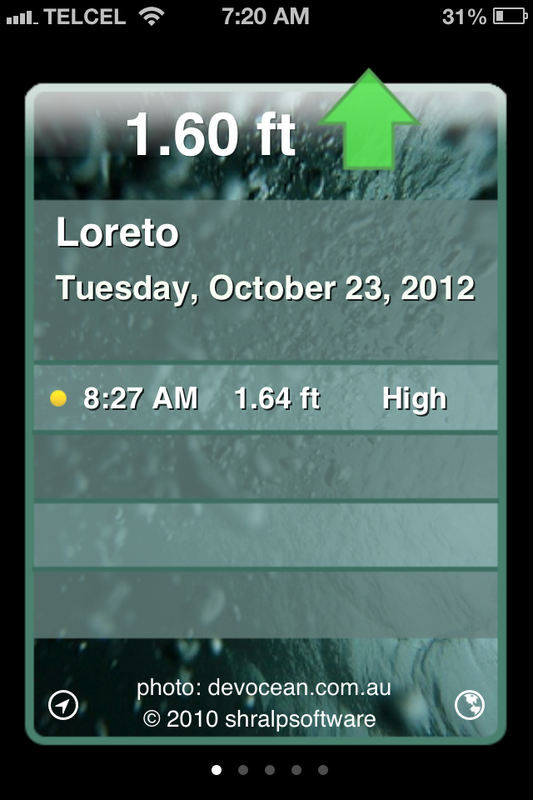 With the low tide last evening before midnight, and the subsequent low tide tomorrow at 12:07am, Loreto will on this day, have only one tide. As I’m not an expert on tides, I sourced Oceana, in an attempt to understand this conundrum. Tides are regular rises and falls in sea level, accompanied by horizontal flows of water, that are caused by gravitational interactions between the Moon, Sun, and Earth. They occur all over the world’s oceans but are most noticeable near coasts. The basic daily pattern of high and low tides is caused by the Moon’s influence on Earth. Variations in the range between high and low tides over a monthly cycle are caused by the combined influence of the Sun and Moon. Although the Moon is usually thought of as orbiting Earth, in fact both bodies orbit around a common center of mass—a point located inside Earth. As Earth and the Moon move around this point, two forces are created at Earth’s surface: a gravitational pull toward the Moon, and an inertial or centrifugal force directed away from the Moon. These forces combine to produce two tidal bulges in Earth’s oceans: one toward the Moon, and the other away from it. As Earth spins on its axis, these bulges sweep over the planet’s surface, producing high and low tides. The cycle repeats every 24 hours 50 minutes (one lunar day) rather than every 24 hours (one solar day), because during each cycle, the Moon moves around a little in its orbit. If no continents existed and the Moon orbited in Earth’s equatorial plane, the sweeping of the tidal bulges over the oceans would produce two equal daily rises and falls in sea level (a semidiurnal tide) everywhere on Earth. In practice, landmasses interfere with the movement of the tidal bulges, and the Moon’s orbit tilts to the equatorial plane. Consequently, many parts of the world experience tides that differ from the semi-diurnal pattern. A few have just one high and one low tide per day (called diurnal tides), and many experience high and low tides of unequal size (known as mixed semidiurnal tides). In addition, the tidal range, or difference in sea level between high and low water, varies considerably across the globe. In addition to the daily cycle of high and low tides, there is a second, monthly, cycle. In this case, the Sun and Moon combine to drive the cycle. As with the Moon, the interaction between Earth and the Sun causes tidal bulges in Earth’s oceans, though these are smaller than those caused by the Moon. Twice a month, at the times of new and full moon, the Sun, Moon, and Earth are aligned, and the two sets of tidal bulges reinforce each other. The result is spring tides—high tides that are exceptionally high and low tides that are exceptionally low. By contrast, at the times of first- and last-quarter moon, the effects of the Sun and Moon partly cancel out, bringing tides with a smaller range, called neaps. A further web search takes me to discussions of distant places, such as the Gulf of Carpentaria in Australia, where one-tide-per-day are not uncommon – something to do with narrow opening of the bay and water trapped. Now this special one-tide-a-day thing happens in other places, for exactly the same reason – places like the Gulf of Thailand, the Persian Gulf, the South China Sea and even the Gulf of Mexico. It just so happens that all these places are some of the very best places on Earth for catching fish. I wonder if the once-a-day tides makes the fish all confused, and easier to catch? It did seem that extra Pangeros headed from the Loreto Marina this morning before sunrise. Maybe there is something to more fish and one tide? All I really KNOW at this point, is that today, there is one tide – a high of 1.64′ will occur at 8:27 AM, followed by a low of 0.09′ tomorrow morning at 12:07 AM. This entry was posted in Baja Living, Moon Rise, Sea of Cortez and tagged earth and the moon, Gulf of Carpenteria, Gulf of Mexico, high and low tides, Moon, nature, Neap Tides, science, tidal bulges, Tides, Waxing Gibbous. Bookmark the permalink.